After 55 days, I harvested my Royal Cookies. 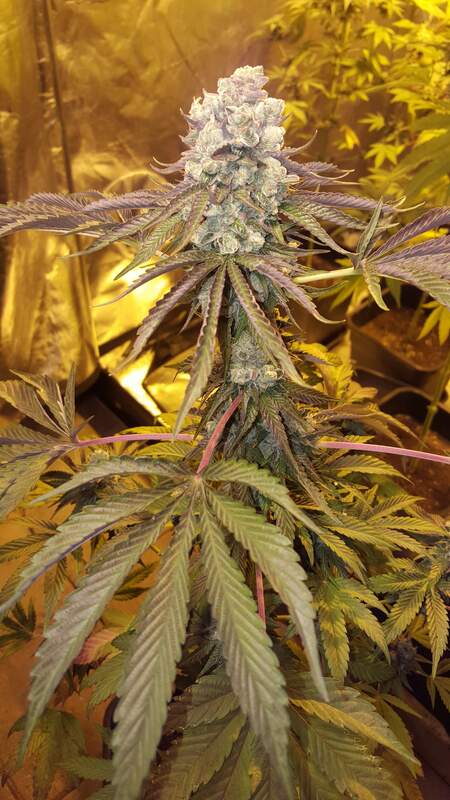 The last 2 weeks plants show a true metamorphosis : beautiful purple colors, rockhard buds and a lot of resin on the flowers. Incredible smell. Overwhelmingly strong. Very pungent. Red basil, cloves. Black Hash like Nepal, Pakistan. Smells like Kush but has a sweeter touch. Some plants have a tiny bit of dark-red, purply cherry / blue berry-smell. Although an Indica, it's really nice to smoke fresh, but I'm very curious how smell and taste will evolve during/after curing. Very strong. Incredibilly stoned effect, but also very high, allmost enlighted,transcendentall. Heavy ,but also happy and very creative effect. Take your time to enjoy these Royal Cookies. Not for a quick smoke, but for a strong mind and body sensation . The first day of the past week I flushed the plants and I didn't gave them any more water since. Yesterday, unfortunately I noticed some budrot in plant#6, So I decided to harvest them all together today. By examination of the buds, I had to remove some affected parts. Fortunately, not much harm was done. For the second time I had a breed of nymphs from Hemiptera (or true bugs), on plant #1 (one of the last photos). A few days ago, I also had a small attack of spider mites on some leaves of plant # 4. A few adult specimens, and some eggs. Fortunately, I had seen it quickly and removed the affected leaves. Without further problems. #1 The Queen, She is the tallest and my favourite. Superb development and shape. Heavenly smell. Strong, purgent but with some sweet subsmell of black berries and cherries. Beautiful purple colors. #7 What a plant ! Although one of the smaller plants, she has become a great lady. A not-so-big but very beautiful cola. The smell is less pungent. In addition to the purple colors of the leaves, she has, like plant # 4 (but less pronounced), beautiful orange stamps. #2 Approximately equal to plant # 1, only a little smaller in size. Also very potent, but with a softer smell. #4 The smallest plant, and also a slightly different type of plant. The plant continued to make new flowers the longest, with beautiful orange stamps. She is very special with her nice diamond-shaped cola. #5 Similar to plants 1 and 2, but smaller. #6 Similar to plants 1 and 2, but smaller and a more fruity smell. #3 Although the 2nd highest plant and her big yield, I place this plant in the last position because it lacks the beautiful purple colors, which all other plants have. If you want a bigger yield, you have to choose Plagron's Terra Bloom. If you, like me, prefer more organic form/taste buds => choose Alga Bloom Use Green Sensation for extra PK ! Select the fastest growing plants and get rid of the smaller ones with misformed leafs. Stress could result in some male flowers in the first weeks of bloom, Check daily. Remove these male flowers manually. Beware of budrot in the last week, perhaps it is better to top the plant so that it gets smaller buds. Great job brother! I'm loving the plants! Nice harvest! @420snowbud, Thx . I would offer you a toke if you were here. Great smell, great taste. Easy to grow. Very nice and useful diary! thanks! Do you know which plant at the end, was the one that at the start had the cotiledons pointing upwards and the first leaves very inmature? I have a similar one. The one in the 8th position, counting from bottom to top, left to right. I mean the first photo, when the plants just germinated. What number correspond to each of those. I mean the very first photo, when the plants just popped out of the soil. What number correspond to each one? thanks for the anwers! Still one the best informative diaries about a strain. One can see that the effect is pretty equal in all phenos, what changes is the size and smells. Cool.